All Hallows Read – Scary Book Giveaway! 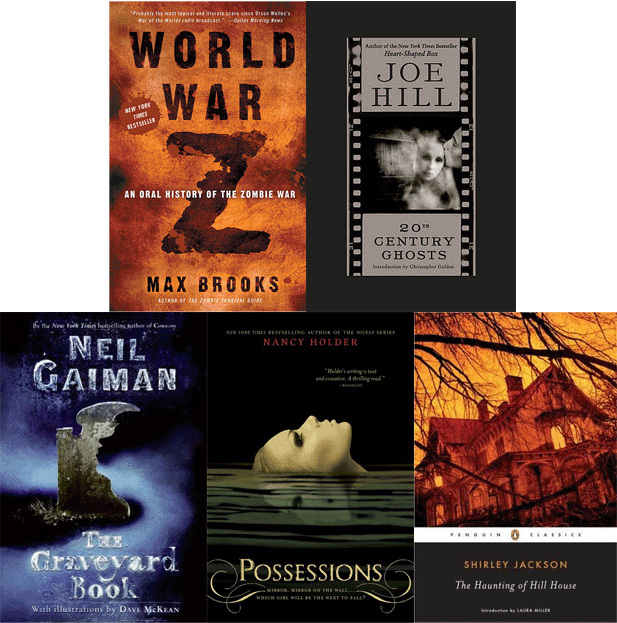 Listed below are the covers of five books that we will be giving away as our Trick or Treat presents this year. Scroll down to find the instructions on how to enter the contest. You can learn more about All Hallow’s Read from author Neil Gaiman in the video below. All you have to do for your chance to win one of the five scary stories listed above is to post a note in the comments below by midnight on October 20th. One entry per person. The contest is open to anyone with a U.S. or Canadian mailing address. The winner will be chosen at random and contacted via email for mailing instructions. If you are under 14, please get your parent’s permission to enter this contest AND mention it in your entry. This entry was posted in Books and Literature, Contest, Holidays, Signal Boost, Uncategorized and tagged 20th Century Ghosts, All Hallow's Read, Graveyard Book, Halloween, Haunting of Hill House, Joe Hill, Max Brooks, nancy holder, Neil Gaiman, Possessions, Shirley Jackson, World War Z. Bookmark the permalink. 55 Responses to All Hallows Read – Scary Book Giveaway! And how could I not be drawn to this? The only books I read are scary books! Of course I’ll go “boost the signal.” Keep it coming, Erin! Sweeeeet. Signal boosted via Twitter. Fun idea, Erin. Sad to say, but I’d pretty much do any Neil Gaiman tells me to. Ngh, he’s so awesome!!! Neil is awesome. If he says read, I say we read. 🙂 Good luck! NICE!! I organize a large horror event.. this is right up my alley! and signal boosted via twitter! Very cool! Good luck, Jackie. Great idea and wonderful giveaway. Boosted on FB. Hi, Jude. I’m glad you like it. Good luck!! Yay for Jason! 🙂 Good luck, Cheryl. First, it encourages reading, then makes it better by having Neil Gaiman hawk it. And to top it off, I have a chance to get free books? Heck Yes. Dave, Hill House is fantastic. Good luck! I love the idea of spreading reading in any way. I boosted the signal, and shared on facebook. now I’m going to go tell all 840 fb friends all about this. Thank you for helping spread books and reading. I am a literacy volunteer and I think you rock! I love this idea. I’m getting my godson a book book on cute monsters. Signaled boosted on Twitter. Now to go buy zombie teeth for me! I love free horror books! Books are the best treat of all. Shared on FB. Thanks for a great giveaway and I boosted the signal. Here is the link. Ps, I love Neil Gaiman. American Gods was genius. Would love to win any one of these books. They all look great and scary. The Possession and the Haunted Hill book look great. Thanks for the giveaway and the chance to win. Best scary book ever is Christine or Pet Cemetary. The only one I haven’t read is Possessions! Would be great to win that one, because my daughter and I are fans! 😀 and I boosted the signal on my Facebook. Awesome! Signal boosted via Facebook! I hope we’re in for a scare! Would be so fun…thanks for the chance!! Good luck everyone!! Neat! Awesome choice in books 🙂 I’ve boosted the signal! Nice!!! Always in for a good read!! Boosted the signal on fb for sure!! Love this! I boosted the signal on my Facebook book page, The Bookshelf! Hmm, what scary book do I want to give away. Boosted via facebook, to a group of labrarian friends, hahahahahaha. I have been dying to read The Graveyard Book by Gaiman. Please enter me …I love scary books..and I posted on my face book page! !